Ancient Stones - Lothian - 023 Hanging Stones, Braid Road, Edinburgh. Two large slabs, actually bases for two gibbets or gallows, can be found embedded in the west side of Braid Road at the junction with Comiston Terrace, just to the south of South Morningside Free Church Hall. They are known locally as the 'hanging stones' and measure 1m square and were found to be about 30mm thick when excavated during road repairs. Braid Road is situated towards the south side of Edinburgh and the use of a street map is highly recommended. At the north junction of Braid Road and Comiston Road, head south along Braid Road, keeping to the western footpath. The stones are recessed into the road surface just before the junction with Comiston Terrace. 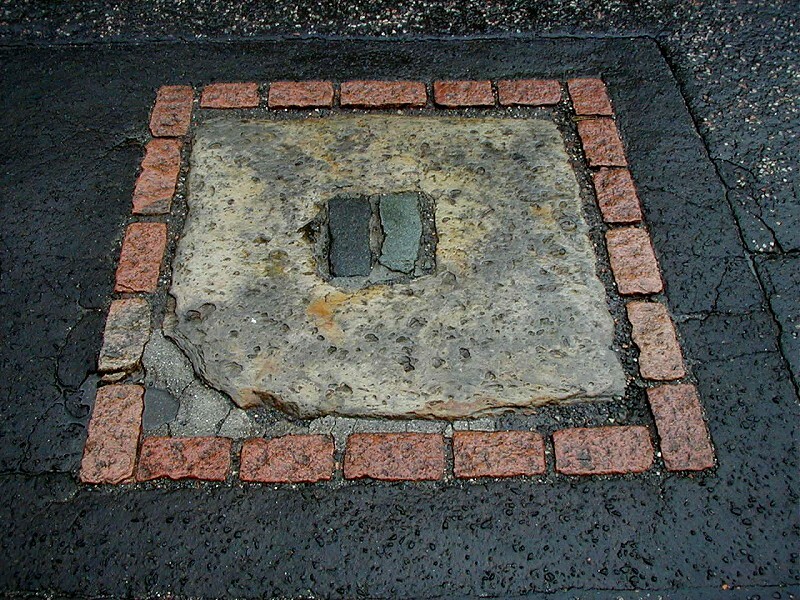 The two slabs mark the spot of Scotland's last execution for highway robbery and the gallows were specifically erected for the hanging of Thomas Kelly and Henry O'Neill on 25th January 1815. An information plaque can be seen embedded in the pavement. The Hanging Stones do not really have a place with most of the other stones in this web site but having tracked them down, I though they might as well be here. There are actually two stones, both very similar.